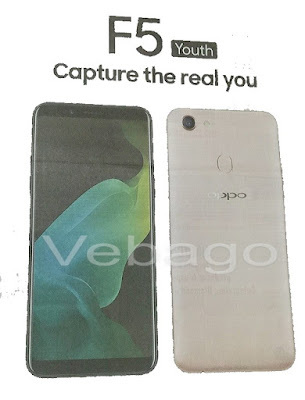 Oppo has launched the F5 Youth smartphone in India on Thursday. The device is priced at Rs.16,990 and comes in Gold and Black color options. The smartphone will go on sale from 8th December through online and offline stores across the country. The smartphone comes with a 13MP rear camera with a f/2.2 aperture and an LED flash. It also comes with a 16MP front-facing camera for selfies with a f/2.0 aperture. The device measures 156.5 x 76 x 7.5mm and weighs 152grams. There is a fingerprint sensor on the rear and runs on Android 7.1 (Nougat) with ColorOS 3.2. The Oppo F5 Youth smartphone is powered by a 3200mAh built-in battery and a 2.5GHz Octa-Core MediaTek Helio P23 chipset processor. It features a 6-inch 18:9 full HD+ display with a resolution of 1080 x 2160 pixels. The device sports a 3GB of RAM, 32GB of storage, expandable up to 256GB with a microSD card. Connectivity options include 4G VoLTE, 3.5mm audio jack, FM Radio, Wi-Fi 802.11 a/b/g/n, Bluetooth v4.2, and GPS.